It is sadly time to wrap up this month of celebrating two of the best genre writers ever to have lived. 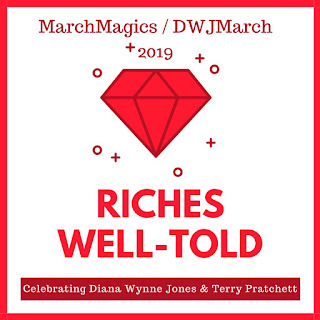 I want to thank all of you who participated and shared the Diana Wynne Jones and Terry Pratchett love, of which there is still an overwhelming amount. Thank you especially to Stephanie, Virginia, and Deborah for your Instagram posts! And also thank you to Chris, Jean, and Kim for your thoughtful blog posts! As for me, I finished the ten books I set out to read. I absolutely loved revisiting all five Tiffany Aching books. I read the first two and listened to the remaining three, usually binge listening over the course of a day. I sorely wish that we had been able to have one more book with Tiffany as an adult, perhaps at the time that she discovered the witch that she would pass on the leadership mantle to. Well, it is now Z's spring break week and we have no plans. So I am going to settle in with some good books and hopefully spend a little time in the sun as well. 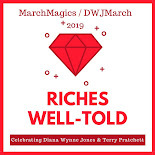 This coming Saturday is Dewey's 24-Hour Readathon so if you haven't signed up yet and want to participate, head over to their site. I'll be posting during the event on Twitter and Instagram. And on Sunday, Z and I are going to see Howl's Moving Castle in the theater for, I think, our second time together. Maybe this time after we see it, I'll be able to convince him to try the book! Once again, thank you to everyone who participated in March Magics / DWJ March - even those who did it quietly. It means the world to me that you come back year after year. I really did too. I did 100% of the month with the two of them and could have kept going. I'm excited to save some new-to-me books for the summer though too! You are welcome! Thank you for being such a great participant. You prompted me to think in new directions and shared some great connections this year!